After the fleet is ambushed in a Cylon attack, Commander Adama is forced to authorize the use of prohibited weapons designed by Dr. Wilker's new protégé...Dr. Zee! As the story opens, Commander Adama is having a nightmare about the destruction of the Twelve Colonies. As the dream nears its end, he witnesses his beloved wife shot down by a Cylon, then the weapon is turned upon himself. Adama awakens in a sweat in his bed and looks at a hologram of his family as they were before the holocaust. It is implied he has this nightmare every night. Later, Commander Adama gives a speech on the latest anniversary of the massacre. Immediately after the memorial, a pair of Cylon baseships suddenly emerges from a nearby nebula that was cloaking them and waves of Raiders are launched in attack. Galactica goes to battle stations and Vipers are launched while Adama orders the rest of the fleet to surge towards the nebula to evade Cylon sensors. A number of the Raiders begin suicide attacks, plowing themselves into the hull of the battlestar, causing great damage. With the Galactica losing the battle, Adama is forced to sanction the use of young Dr. Zee's new temporal weapons. Apollo and Starbuck are given two Zee-modified Vipers equipped with the new weapons, which remove their targets from the timeline as if they never existed; but these weapons are extremely dangerous and unpredictable, in that they disjoint time itself. The two successfully use the weapons against a pair of Cylon Raiders, before targeting the baseships. But a suicide attack against the Galactica causes the temporal battery housed aboard her to overload, causing the battlestar, the fleet, and the Cylon attack force to vanish in front of Apollo's and Starbuck's startled eyes. Initially, writers Abnett and Lanning were signed to do this series as a follow-on of Dynamite's Galactica 1980 mini-series from 2009, with a story set 33 years later in 2013. But Dynamite later decided they wanted to celebrate the upcoming 35th anniversary of Battlestar Galactica by having stories set in the time period of that series. Abnett hints that the Galactica 1980 follow-up will come later (possibly as another mini-series); see his interview at Comic Vine. The inside front cover of this issue presents the preamble of the theatrical version of the BSG pilot, which ends with "...far, far away amongst the stars." The last line probably was originally written to suggest the "galaxy far, far away" slogan associated with Star Wars. This preamble was also used in Dynamite's Battlestar Galactica: Cylon Apocalypse mini-series, published in 2007 (see the study, "The Infidel Basestar"). As usual when the franchise wants to present Commander Adama as yahrens older than he was in the Battlestar Galactica TV series, he is given a beard. Here, he sports a Van Dyke instead of the full beard seen in the War of Eden mini-series or in Galactica 1980. On page 2, the battlestars present at the Cylon-Colonial peace accord (in "Annihilation") are listed as Atlantia, Acropolis, Pacifica, Triton, and Galactica. These are, in fact, the same ones mentioned in various pieces of dialog in that earlier episode. In Adama's nightmare on pages 1-7, he is depicted with his beard, even though he did not have one at the time of the peace accord in "Annihilation". But, I suppose we usually see ourselves in dreams more-or-less as we currently are, even when dreaming about the past. Page 10 reveals that the fleet has a memorial day on every anniversary of the Cylon massacre at the Colonies. On page 10, panel 3, we see that a young Dr. Zee (from Galactica 1980) is a member of the fleet at this time. In panel 5, of page 10, two figures that look like the Paradeen robots Hector and Vector (from "Greetings from Earth" Part 2) are seen. But there was certainly no indication in that episode that the robots would not stay with their owners, Michael and Sarah, on Paradeen. Did the fleet pick up two other robots while still in Terran space? Also on page 10, Adama's speech is seen on screens throughout the fleet. Some of the screens appear to be holoscreens. Though holoscreens were never seen in the TV episodes, it makes sense that an advanced technology such as that wielded by the Colonials would include holographic communications. Some holographic display elements are also seen in the Vipers (and in use by the Cylons as well) in "Time and Punishment". 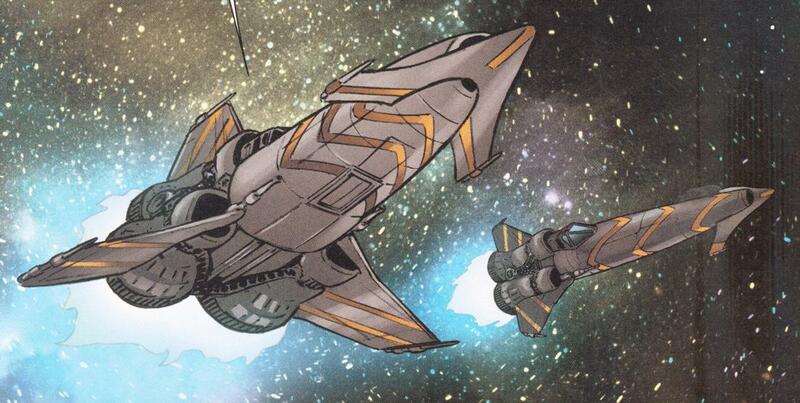 Page 12 reveals that the fleet has been using a nearby nebula to cloak its position from the Cylon chase ships. In a similar situation in "The Infidel Basestar", the fleet was hidden inside the Korax nebula for three weeks to evade the Cylons. As Galactica scrambles Vipers, Starbuck remarks, "Let's wrap this fast! I've got a game of pyramid to finish!" But we saw that he was just at the memorial ceremony, not at a card table! 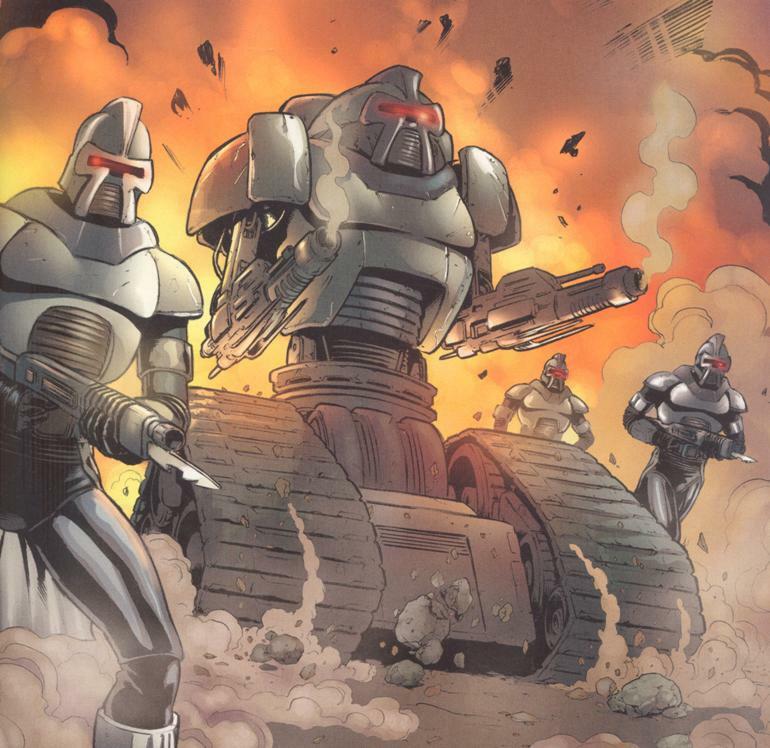 During the space battle against the Cylons, some of the Raiders perform suicide runs against the Galactica, similar to their actions in "Fire in Space". It's unrevealed here whether the Raiders are loaded with explosive solenite as they were in that earlier episode. Page 14 reveals that Zee is a protégé of Dr. Wilker at this time. The Zee that appears here seems to be the same one, though younger, who is seen in Dynamite's Galactica 1980 mini-series, which takes place at a later date. On page 15, Starbuck refers to Cylons as "toasters". This slang term was originally introduced in the BSG2000 TV series and this is its first use in the BSG70 canon of which I am aware (though Starbuck does refer to them as another kitchen appliance, "blenders", in "Bio-Weapon"). Also on page 15, Dr. Wilker refers to Zee as an old mind in a young body. This is mentioned again in the first issue of Dynamite's Galactica 1980 mini-series. It's subtle, but notice on page 16 that the two temporal Vipers have tandem cockpits, seating two. This was a feature of the Vipers seen in episodes of Galactica 1980, at least two of which also had the ability to travel through time. This 5-part story deals with the ramifications of time-alteration after the use of temporal weapons. Since the weapons are said to have been historically prohibited because of the unpredictable results of disjointing time, it is implied that the Colonials once had and used them in the past, presumably during the existence of the Twelve Colonies. Was time already altered in some way by the use of such weapons by the Colonies? Or could the disaster that struck Kobol thousands of yahrens ago be related to the use of temporal weaponry? If so, the prohibition against such weapons may have been handed down from the ancient Kobolians, perhaps even in the Book of the Word.